Yeah - 160 proof is around double the usual proof for regular whiskey, so you can cut it 1:1 ratio with water and then end up with "normal" hooch. I looked into all the licensing and whatnot at one point -- researched all the state of the art reflux distilling column designs, etc. My plan was to build all my own gear. Ultimately I decided not to pursue it -- too much legal red tape. Despite having tons of different wines, liqueurs, liquors, etc. in the house, I hardly ever drink and was mostly interested in the technological aspects of the apparatus. John has three or four stills, as well as an astonishing amount of gear for building beers and wines. I've been making my wine with his equipment for about three years or so now. every time I go over there he has something new for tasting. I've had lemon wine, maple whiskey, corn likker, homemade gin, you name it. Some of it is awesome (maple whiskey for one), and some of it is hazardous waste (that corn likker was worse than drinking diesel fuel). The beer and wine is unsurpassed, especially at the price I pay to make it. It costs around $4.50 per bottle, and I doubt you could buy the equivalent for less than ten times that at a retail outlet. Everyone should make their own beverages. Gives a whole new meaning to 'LEAN" Or are they just being marinated? You may have noticed that I bear a small resemblance to them, except for the ears. daftbeaker wrote: You are a bad, bad man. I actually felt a bit nauseous looking at some of those. 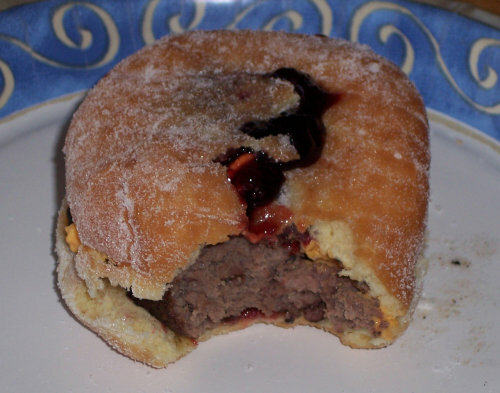 Seriously, Americans complain about baked beans on pizza but will eat a cheeseburger in a jam doughnut? 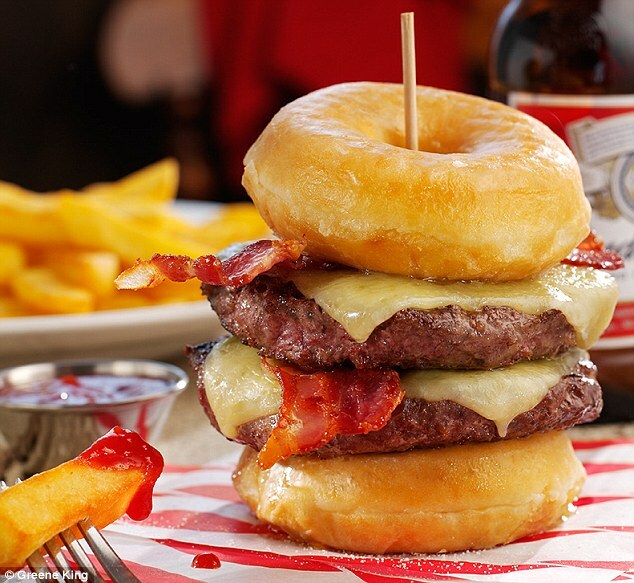 Perhaps because the taste of sweetness of doughnuts and salty taste of bacon plus meatiness of burgers are perfect combination than burger bun. Pretty self-explanatory. Wrap bacon around an olive, stick it with a toothpick and throw em in the oven til they're all crispylicious. Purple Lil wrote: Bacon is awesome! Wore it for halloween. Don't. Judge. Me. No judging from me! Bacon would make an excellent costume! StayThirstyMyAguila wrote: Wore it for halloween. Don't. Judge. Me. Wife bought me a bacon makin' kit. Took me a year to get the gumption to do it, but holy FSM!!! It came out so well and I have never tasted so many flavors in a piece of bacon. I highly recommend trying it. 1. Buy a pork belly, trim fat and/or skin. 5. Cook to 150 deg.